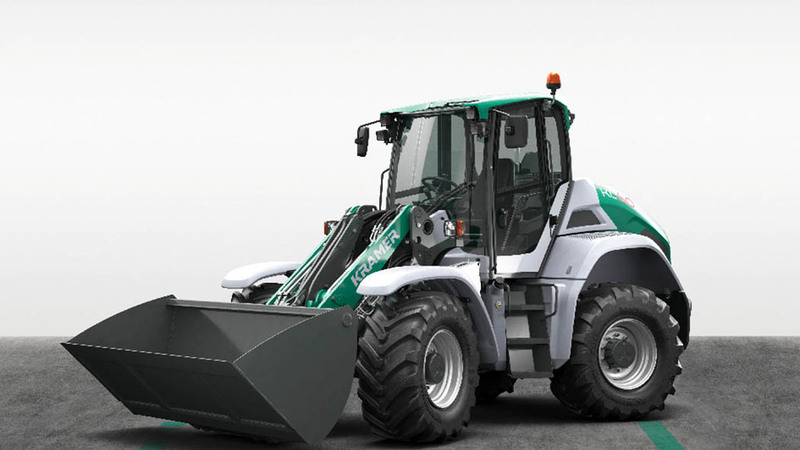 Kramer offers its KL60.8 with 136hp or 156hp Deutz engines. Sticking with its four-wheel steering concept and rigid body, Kramer recently revealed its largest loader to date. Tipping the scales at just more than 10 tonnes, the KL60.8 features an in-line bucket tipping load of up to 5,600kg, and can lift to a height of 3,765mm (12.3ft) at the pivot point. A longer lift arm, offering a lift height of 4.2 metres (13.8ft) is available as an option. A telescoping version is still to come. Optional hydraulic performance packages include 150 litres/min or 180 litres/min units, and steering modes include all-wheel, crab and front axle. As standard, power comes from a 3.6-litre four-cylinder 136hp Deutz engine. A 4.1-litre 156hp version is an option. Both meet Stage 4 emissions regulations; the smaller using selective catalytic reduction and a diesel oxidation catalyst, and the larger also getting a diesel particulate filter. Specially developed for the KL60.8 is a new hydrostatic transmission offering speeds from 0-40kph (0-24mph) via a single range. Top speed is said to be achievable at 1,550rpm. Up top is a new cab featuring a 7in LCD display, enabling machine performance data to be viewed and settings to be carried out, including an automatic bucket return feature.